Ages ago, a friend of mine was getting his artist friends to draw/paint interpretations of the Fool tarot card. I painted a background on a little 3×5 piece of canvas board, and then forgot all about finishing it for one reason or another. The other day I pulled out the old background and was contemplating adding in a figure properly. 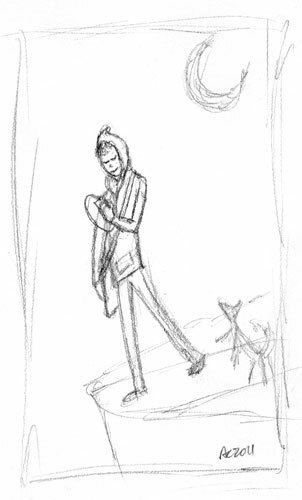 When I decided to sketch it out, I was amused to find that what came to mind was the iPod-wearing, oblivious hipster you see above.